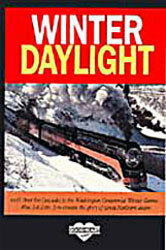 Sun and snow were made for steam, and there's plenty of all three in "Winter Daylight!" This is the story of 4449's visit to the Washington State Centennial Winter Games in 1989. Coverage includes the ferry trips to and from her home in Portland, Oregon, but the focus is on the series of excursions run out of Wenatchee to Leavenworth. This route, on the Burlington Northern Railroad, has steep, 1.1% grades and runs through scenic apple country. You'll see the billowing steam plumes and hear the booming exhausts that only winter weather can produce! Includes cameo appearances of Mt. Rainier Scenic #5 that also ran during these events.